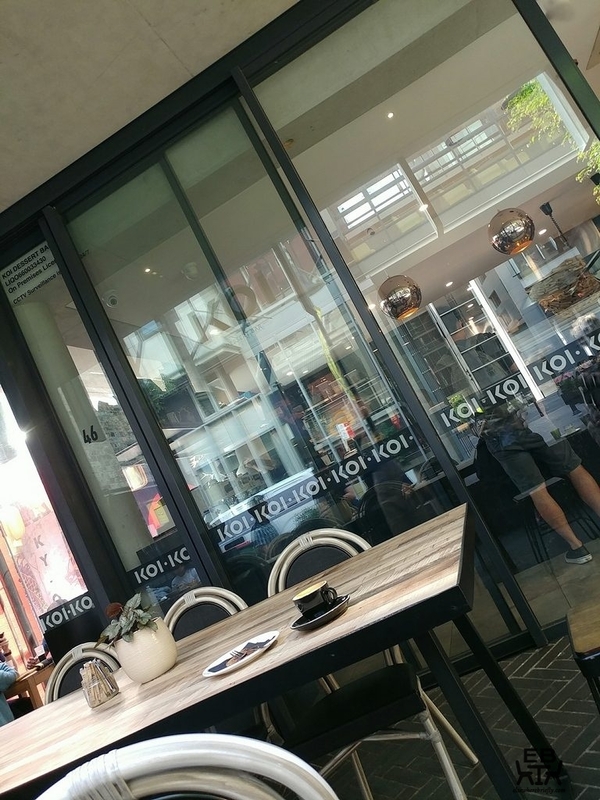 KOI Dessert Bar was on our list of places to visit when in Sydney, after having, like many others, seen the intricate creations on Masterchef. 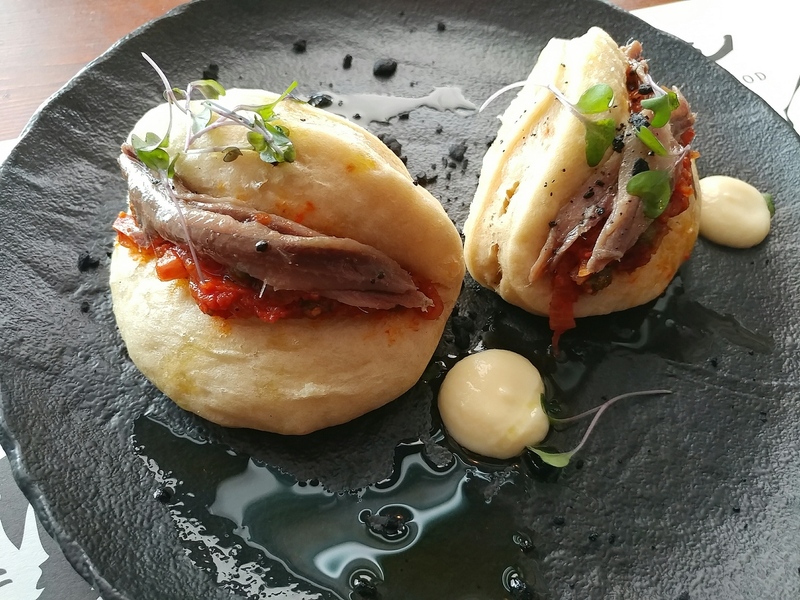 We had had the chance to try some of their wares on prior visits to the KOI Dessert Bar popup at HWKR, but were keen to have them at their origin. 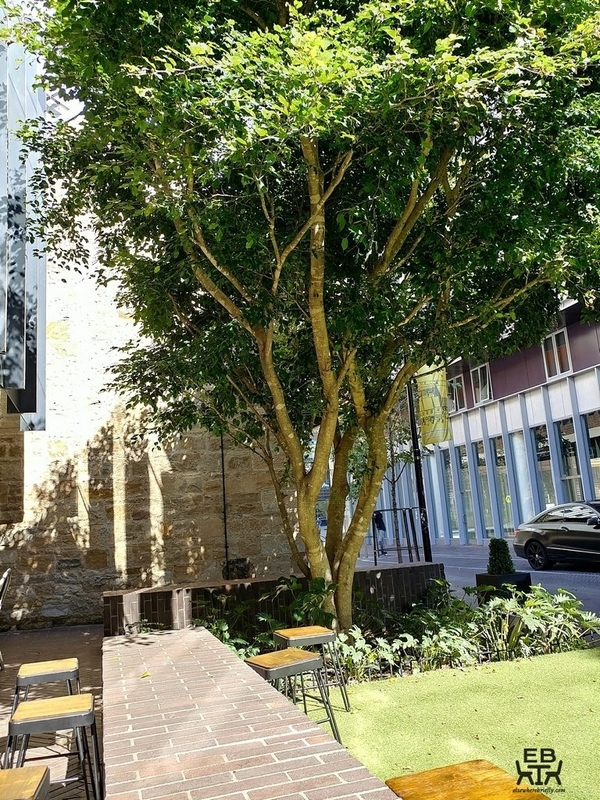 Located on the lifestyle hub of Kensington Street, and close to residential tower blocks, it seems cleverly positioned to maximise access for a captive audience that would appreciate what it produces. It sits in a standalone building with a modern glass and steel exterior. It was a clean, classical design that blended into its surroundings rather than clamouring for attention with garish colours or shapes. 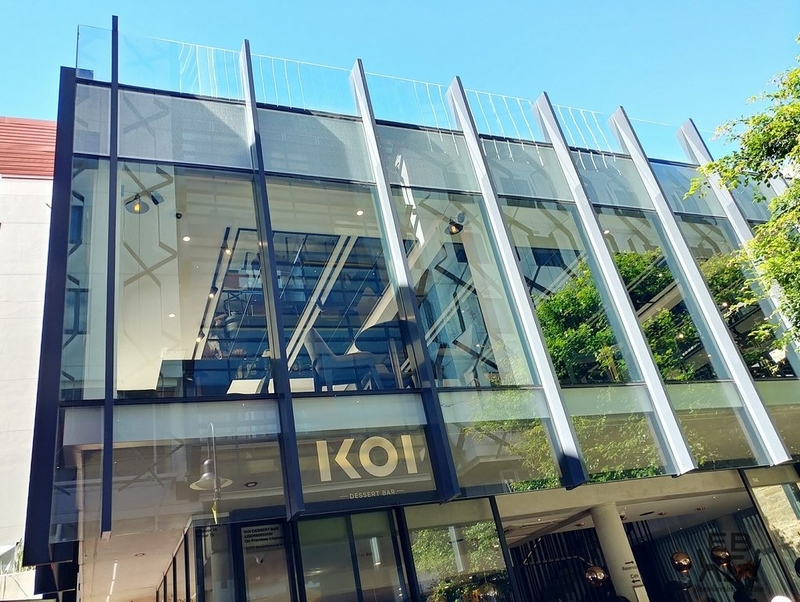 “KOI” was spelled out at the front of the building over the entrance in muted gold letters, so that you knew that that was the place. The building that houses KOI Dessert Bar. It is a two-storey building, with the ground floor housing the display cabinet and service counter, with the kitchen behind that, and a few counter seats. There is more seating upstairs, and at the front of the building is an astroturfed area partially enclosed by a low brick wall that doubles as another seating option. At the ground floor of KOI Dessert Bar. You can almost see the service counter through the glass. 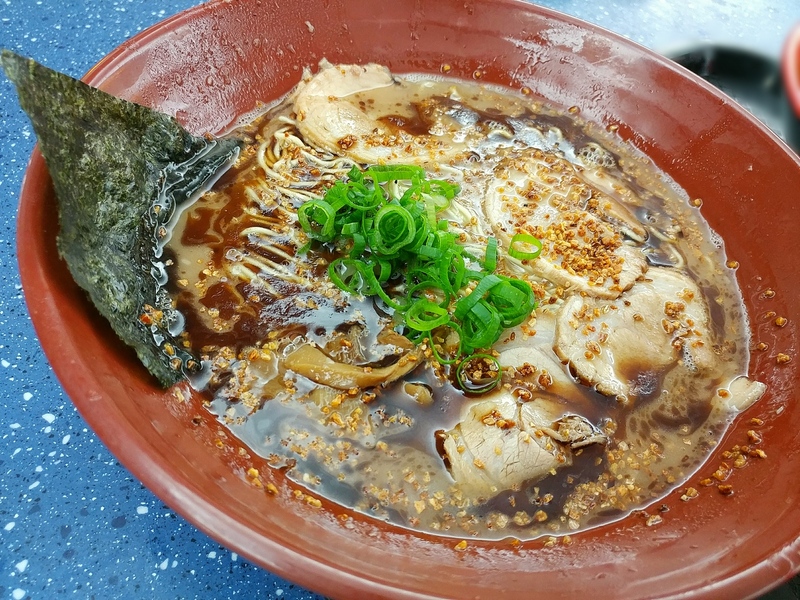 We joined the line to order. 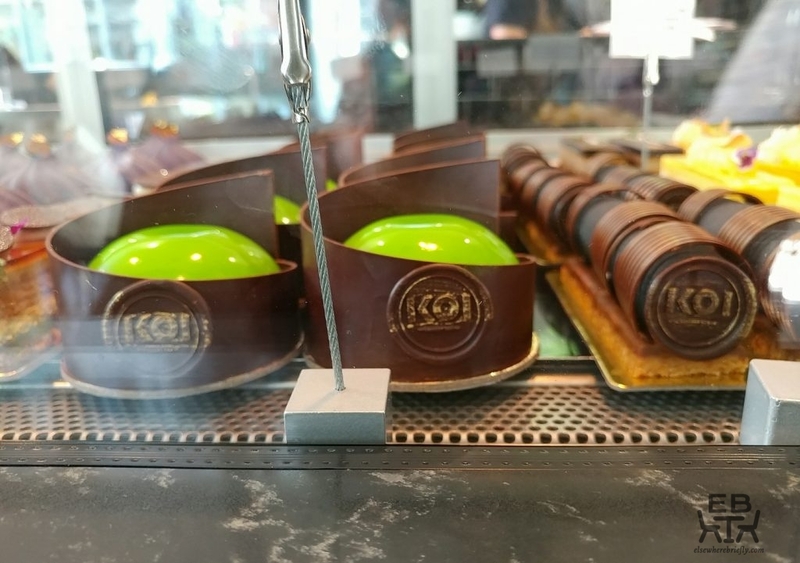 There was no way to tell what your options were until you approached the very front of the line and actually had a view of the display case though, as there was no menu or list of the desserts available. This likely slowed the process down, as people only had a chance to consider their choices when it came to their turn, and spent time deliberating then rather than placing their orders right away. There was, however, a tasting menu posted on a pillar at the entrance. This had 8 items, the majority of them savoury, but with intriguing mixes of ingredients. At $88 per person, this was a culinary adventure we were happy to embark upon. When it eventually got to our turn at the head of the line, we tried to order the tasting menu..but were then told that it was only available after 1730. That was unfortunate, as we already had other plans for later in the day. We were then stuck trying to choose between the many colourful, glistening options in the display case. 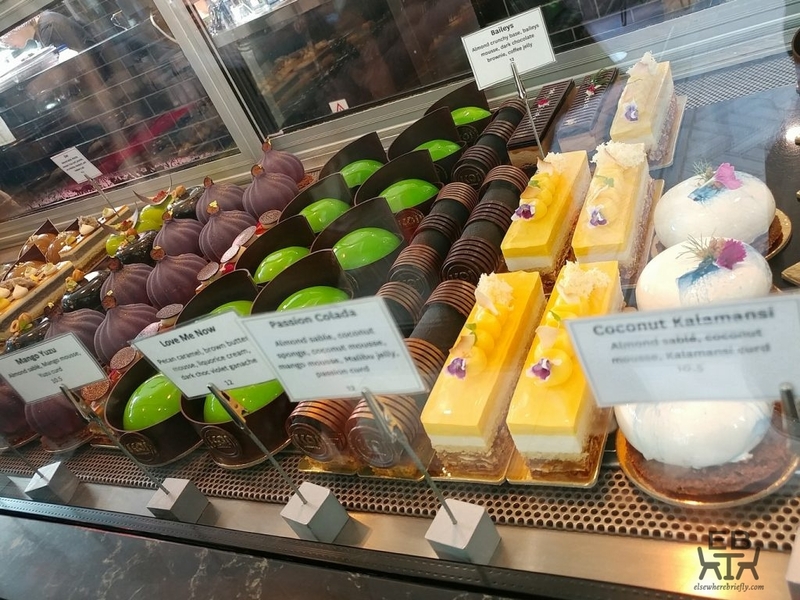 A range of colourful cakes under the glass. Some of them we had seen before at their pop up at HWKR, and some were new options. Each had a number of components, some more intriguing and unusual than others. 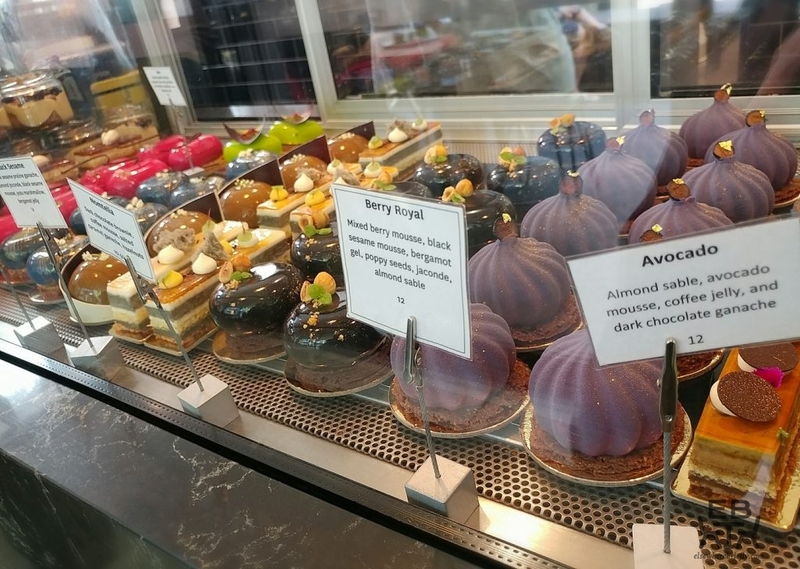 The Avocado, for instance, had almond sable, avocado mousse, coffee jelly, and dark chocolate ganache. 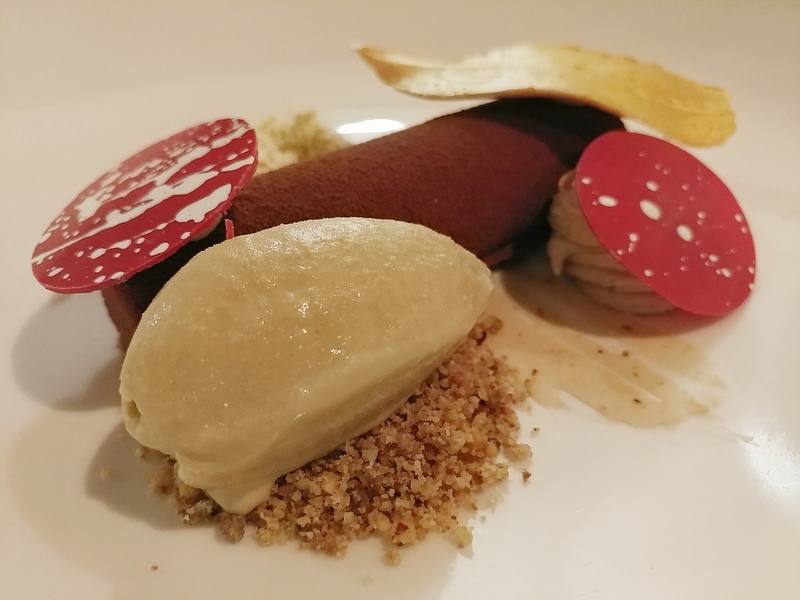 Less surprisingly, some incorporated asian flavours, like the the Black Sesame, which had black sesame praline ganache, almond joconde, black sesame mousse, yuzu marshmallow, and bergamot jelly. 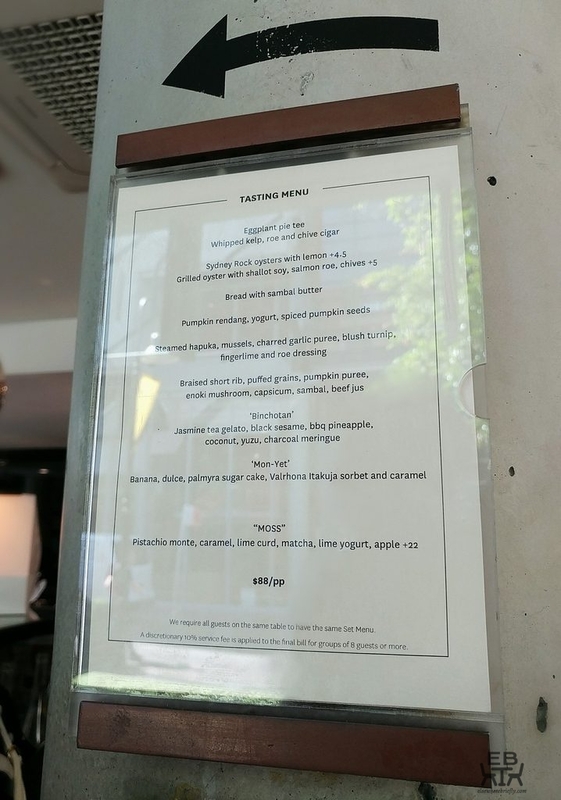 Out of the many choices, we eventually chose the Moss, because it looked like it showed off a number of techniques, and it was listed on the tasting menu, so it felt like we could try at least a part of the menu. A closer up of cakes that are not the Moss. Neatly printed logos. We were given the jar of Moss on a plate, and a number so that they could bring us the coffee we had also ordered later. The counter seats being occupied, we headed just outside, and pulled a couple of stools up to sit at the low brick wall, using it as a table. It was pleasant outside, shaded from the sunny day, with the surrounding buildings providing some shelter from the wind. Seats in the outside area. 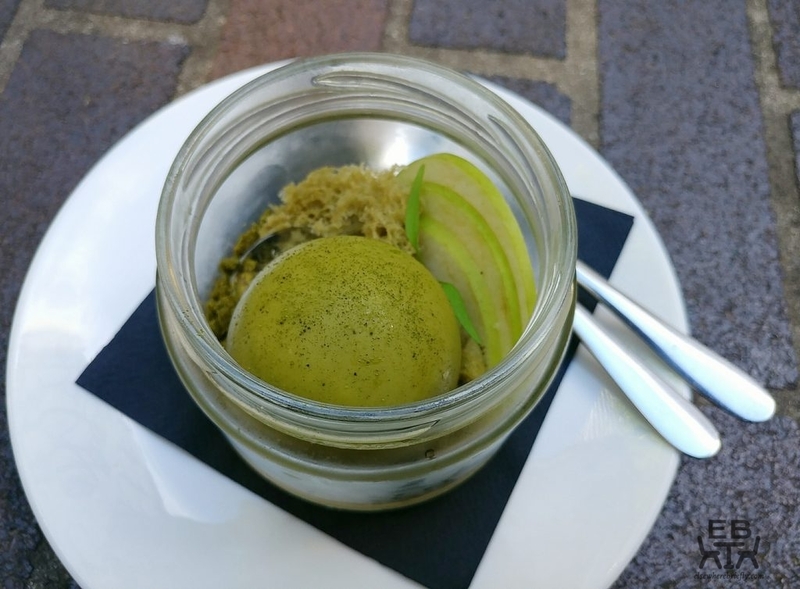 The Moss had caramelised white chocolate cremeux, pistachio mousse, caramel jelly, matcha soil, apple jelly, pistachio micro sponge, and dill. 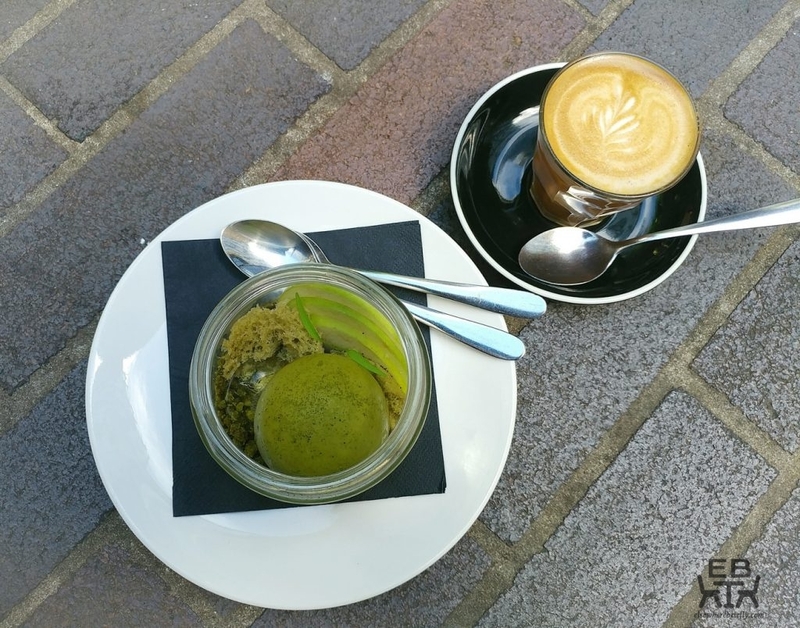 Presenting in glasses or jars sometimes seems like cheating, for instance when eateries serve their fondant still in the ramekin or the panna cotta set in the dish, because they have bypassed the crucial step of the dessert proving its ability to hold together. While the individual entremets have to maintain the integrity of their layers, wrapped under a perfectly even exterior, things in a jar can rely on the walls to keep their components together. In this case, however, the glass jar made a good display prop, and with the contents, it looked just like a terrarium. The use of green and earthy shades, and the organic forms of the components, showed that plenty of thought had gone into the composition. The branching fronds of the torn sponge, and the smooth surface of the clear jelly placed like a water droplet, were elements that made for great visual effect. They certainly took heed of the maxim that we eat with our eyes first. The Moss. Caramelised white chocolate cremeux, pistachio mousse, caramel jelly, matcha soil, apple jelly, pistachio micro sponge, and not dill. A closer look at the Moss, with more detail of some of the contents of the jar. The Moss ball from the side, showing more layers. Looks just like a terrarium. 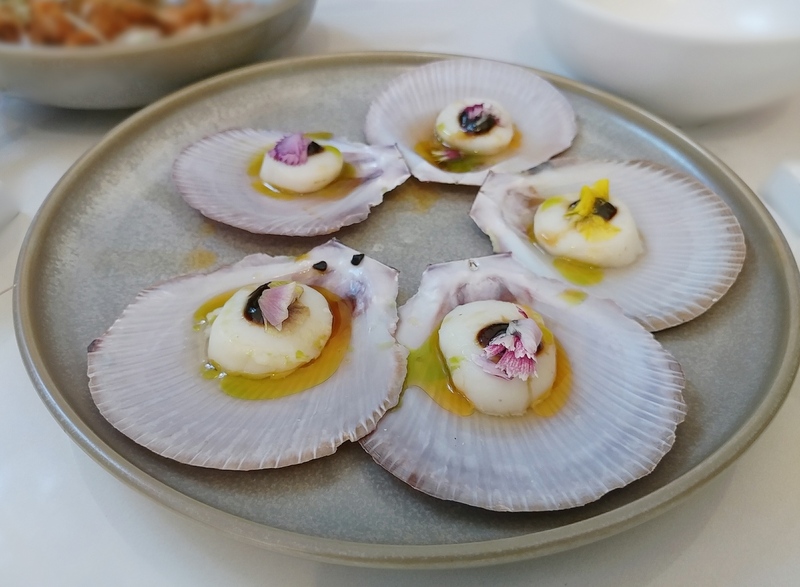 Ultimately, a dish has to do more than just look pretty though. It has to actually be good to eat. We approached it by first attacking that green sphere. With a determined strike of the spoon, we cracked the shell. The chocolate shell had been well tempered, and had a rewarding snap. It was thick enough to not be too fragile, but wasn’t solid to the point that in the effort to break it open, one crushed the layers inside. It is also worth noting that we couldn’t actually see a join point where the halves of the sphere would have been put together, so it was deftly constructed indeed. 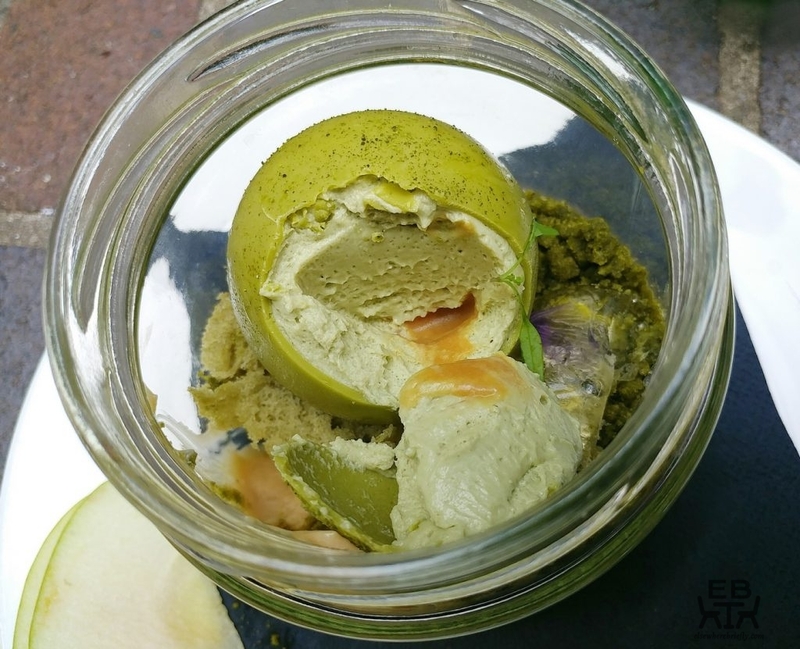 Inside the sphere were layers of components – what tasted like a pistachio cremeux, pistachio mousse, and caramel base. 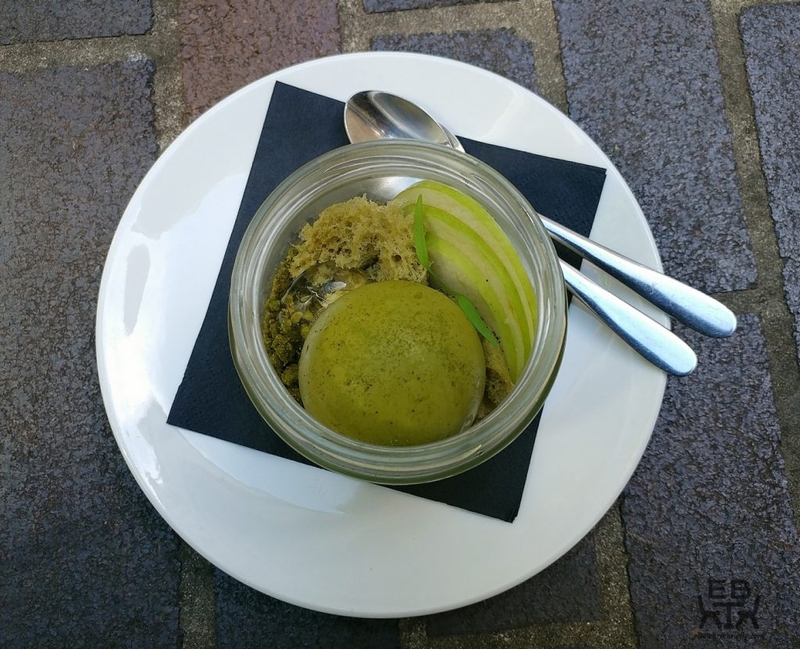 They melded well together, smooth, rich, with definite pistachio flavours, and not too sweet. 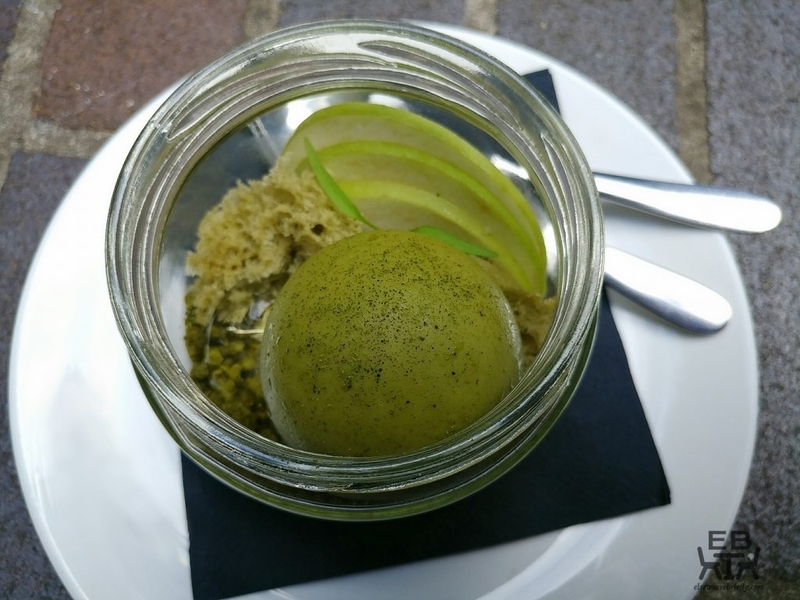 The torn microsponge cake pieces were soft, and though had a green shade from the pistachio, didn’t really taste like pistachio when had on their own. The water drop-like jelly was clear and firm, and had citrus notes with the apple. 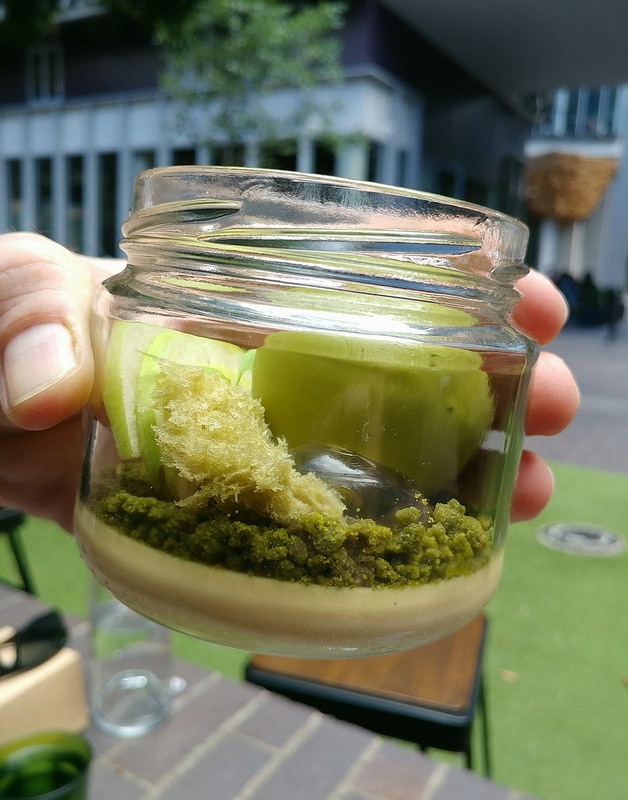 The matcha soil had earth flavours with no bitterness, and hidden in it, rather than just being a crumb, were rice bubble-consistency bits that, as the ad used to go, snapped and popped when bitten into. Right at the bottom of the jar was the caramelised white chocolate cremeux. It too was creamy, smooth, and not too sweet. All together, it was a cleverly done dessert with components that provided a variety of textures, and carried the flavours they promised. More layers inside the sphere. As a side note, the coffee was alright. 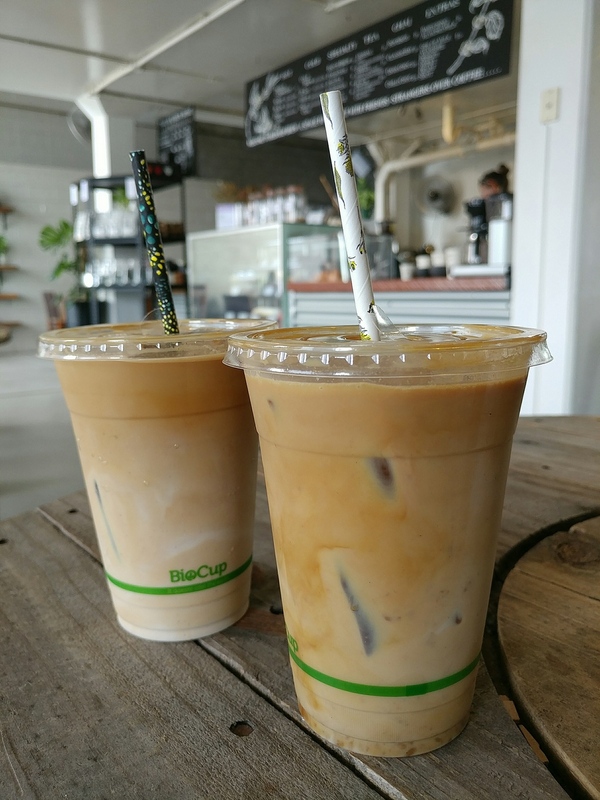 Not the best coffee around, but also not bad. 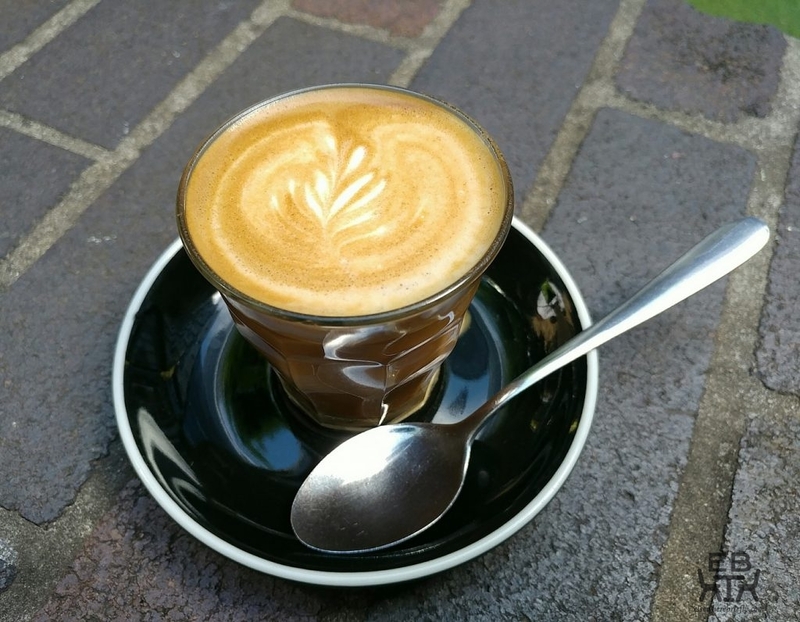 And, really, you’re at KOI for more than the coffee. All in all, KOI Dessert Bar definitely delivered on the dessert. There was complexity and craftsmanship in what they put together. We would have liked to have found out what they can do on the savoury side, but that will have to wait for another time. Meanwhile, we can certainly recommend going there for dessert, at least. Price point: $10.50 to $15 for individual desserts.